So Gerard Butler surfed away from the ongoing Point Break reboot, and you allowed yourself a moment of hope that the Hollywood Gods had decided to leave one of your precious, classic action-bromance movies alone. Think again. Edgar Ramirez has entered negotiations to play the character of Bodhi in the reboot, according to THR. The Venezuelan actor’s previous credits include Zero Dark Thirty, where he played Larry, and Olivier Assayas’ television mini-series Carlos, which earned him a Golden Globe and Emmy nomination. Though he’s in conversations for the role, Alcon principals Andrew Kosove and Broderick Johnson said to the trade, "We consider Edgar one of the finest actors in the world today, and we are thrilled he will be creating a fresh new take on the iconic character of Bodhi." So it sounds like a done deal. The "take" Edgar Ramirez will try to erase from our minds belongs to the late Patrick Swayze, who personified the Zen-like surfing guru in Kathryn Bigelow’s adrenalized Point Break back in 1991. And that’s part of the reason why I’m spiritually against a Point Break re-do. Bodhi might not be Patrick Swayze’s most iconic role (that, I believe, belongs to dance instructor Johnny Castle in Dirty Dancing). But he so fully embodies the part that I don’t envy Edgar Ramirez for having to give it another go. The plot of the new Point Break will elevate the concept to the world of extreme sports, with an undercover FBI agent (this time played by Luke Bracey) infiltrating a gang of thieves. 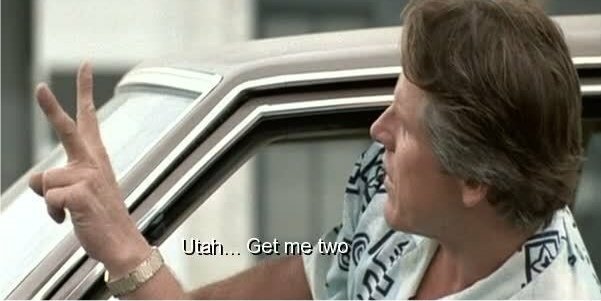 As we’d previously reported, curmudgeonly kook Ray Winstone will take the Gary Busey role in the remake, so Utah, get him two! Casting on the Point Break remake is heating up, even as Gerard Butler falls by the wayside. Variety notes that Clemens Schick has been tapped to play one of the members of the criminal gang that Edgar Ramirez will lead. No word on whether or not they will be wearing masks of ex-presidents. Ericson Core is on board to direct the film, which is expected to reach theaters on August 7, 2015.